Some clinicians, particularly the persons related to Orthopaedics are almost avoiding using any form of Stethoscope in their practice mainly for asepsis. Laennec was the father of Stethoscope. Laennec Stethoscope needs modernization to Electronic Stethoscope comparison in the context of asepsis, usability and cost reduction. We have to go back to Laennec Stethoscope, add a convertible with snap on electronic part on the ear piece to make it audible in stereo way, set IEEE Standard and fix the Stethoscope brand-cost matter. In this way we can use the Stethoscope in both without the electronic part as regular Monaural Stethoscope or as Stethoscope. Added advantage is full control on Quality, easy design, superior acoustics and most importantly – sterilization and prevention of cross infection. This article describes how Laennec Stethoscope to Convertible Electronic Stethoscope can be done & other matters. The idea to re-use Laennec Stethoscope’s design came in author’s mind from one Startup company’s great $500 electronic stethoscope. Sound travels better in straight line. Wood & Ivory are age old materials used in musical instruments. So much delicate sound of piano becomes great out of the great quality of wood. That Startup Company reinvented the Laennec Stethoscope by keeping the current chest piece design used by the Acoustic Stethoscopes and added a port for 3.5mm normal earphone jack. Their model has control of output volume and control of frequency of sound to be captured. Their product page has the points which factually promote Laennec Stethoscope. Instead of diaphragm, their Electronic Stethoscopes use a different type of microphone – Electromagnetic Diaphragm. There is difference with the others. We can not make that Startup Company’s thing directly. Electromagnetic Diaphragm is one of the key of that Startup Company. That is their patented material. They made Laennec’s one smaller with that Electromagnetic Diaphragm. 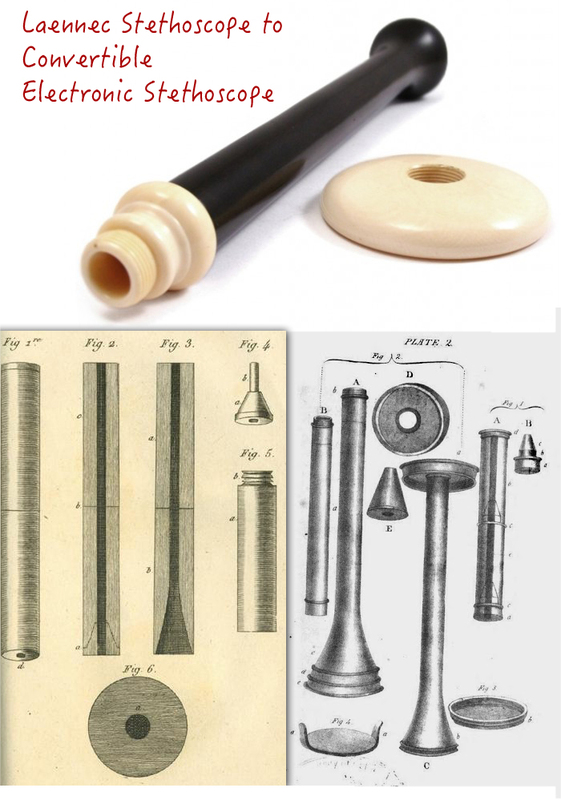 Needless to state the facts – Laennec Stethoscope’s design is freely available, Obstetrics still use the Monaural Stethoscope for auscultation of fetal heart sound, we do not have huge psychological issues to use a Stethoscope like Pinard. Stethoscope is not so important today where hand held USG is available. We love to boil the stuffs. Laennec Stethoscope’s design can be sterilized. When we add microphone to Acoustic Binaural Stethoscope, it becomes pathetic. Acoustic Binaural Stethoscope itself bad by acoustics. Re-using Laennec Stethoscope’s design or Piorry or Traube stethoscope will solve that problem. There are 2 important publications related to Stethoscope Acoustics – one is older, work done in the ’60s by comparing the Laennec Stethoscope with the Acoustic Binaural Stethoscopes, which is quite modern (they created a DIY artificial ear following anatomy & a microphone) and practical. Another recent work which took almost all the practical factors in to consideration to compare the current popular models of Acoustic Binaural Stethoscopes and Microphone (read Electronic Stethoscope with different name). Both the studies shown some basic facts. Basic advantage of Binaural Acoustic Stethoscope is hearing with both ears. That is suitable in very busy emergency. Apart from that, usage of Binaural Acoustic Stethoscope with traditional BP machine is easier over the Laennec or Traube Stethoscope. For that reason, we can add snap on on Laennec Stethoscope’s design and convert it to modern Electronic Stethoscope, set IEEE Standard to prevent further exploit by the lay. Original Laennec Stethoscope ( the third version Laennec ) is factually baton like. All probes are like small batons. Piorry type stethoscope is not bad looking at all. Adding a detachable microphone with circuit to Laennec’s original design works fine to convert it to “stereo sound” on need. Circuits to amplify, control the frequencies can be easily done with FOSS design hardwares. Cost of the wooden, ivory is far higher and good craftsmanship is the major challenge. However, one can use a very cheaper wood for economy grade Stethoscope. Current 3M stuffs costs like purchasing a hand held USG. Electromagnetic diaphragm is a capacitive sensor, coated with a conductive material. A conductive plate is positioned behind and parallel to the diaphragm. In this way the conductive elements form a capacitor. It forms an acoustic sensor, which is like the condenser microphones. So their Electronic Stethoscope works like good Stethoscope – pressure dependent bell & diaphragm change. A condenser microphone operates on the basis of air transmission which cannot be placed against a body to record sounds originated within the body directly. Electromagnetic diaphragm is patented. In other words – adding a condenser microphone to ear piece with circuit to control input-output sound by loudness & frequency works fine. Original Laennec Stethoscope had certain reasons to use it in day to day clinical works. Keep the hands or fingers away from a female patient’s chest. Magnification of sound with simple acoustics. Indeed, at the beginning of 1900, several clinicians were not in favor of current design of the Acoustic Stethoscopes. Sir William Osler had his own mono-auricular Acoustic Stethoscope. Adding the flexible tube broken the design principle of original Laennec stethoscope. Instead of single piece of wood, a tube filled with air added. Dr. Littman’s original design is currently in use among all the Acoustic Stethoscopes. They have a basic problem of less louder sound. Dr. Littman himself indirectly pointed to depend on other modern clinical instruments with it. In the year 2015 Dr. Tarek Loubani released an open-source 3D-printed stethoscope based on the 1960s-era Littmann Cardiology 3 stethoscope. Testing Laennec Stethoscope third version or Traube type stethoscope clinically for better acoustics in quiet room with so called great stethoscopes will clarify which are comparable. Laennec Stethoscope third version or Traube type stethoscope or Piorry type stethoscope with same material. Piorry type stethoscope should be better but costly to build. Constant non-electronic part – materials, dimensions, design etc. Detachable electronic part – design of snap on, all hardware specification, all software specification. Sterilization – Capability of the non-electronic part. Except the anesthetists, none would face problems. Only the anesthetists need Acoustic Binaural Stethoscope. That is the only odd position to auscultate to confirm the placement of tube. Computer-aided auscultation (CAA) in Free Software Development Model Can Really Progress. I have no doubt that Monaural will perform better & can be tested by any instrument. For that reason of performing better, the old clinicians wrote the books like as if they can see. This Article Has Been Shared 1241 Times! Android Operating System is currently a hot topic because of the Android Tablets. Here is the details of Android OS along with its capabilities. Neural Modelling with PHP and PostgreSQL will be the best way for implementation. As pointed out by GENESIS, we need upgrade in coding. Here is key points. Microphone is a transducer, the sound air pressure create vibrations and Microphone changes it to electrical signals. Microphone is actually a kind of sensor. Cite this article as: Abhishek Ghosh, "Laennec Stethoscope to Convertible Electronic Stethoscope," in The Customize Windows, March 31, 2016, April 23, 2019, https://thecustomizewindows.com/2016/03/laennec-stethoscope-to-convertible-electronic-stethoscope/.